Shasta Gold Corp is a privately owned gold mining company with projects in Nevada and California. 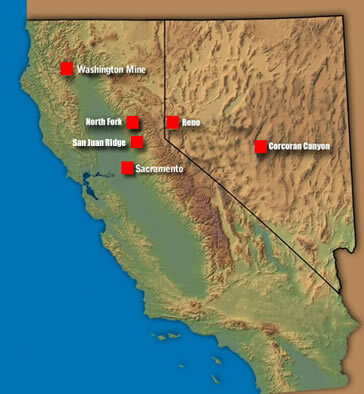 The Washington mine in Northern California is currently the most advanced project. From October of 2007 until March 31, 2008, the average recovered gold grade at the Washington Mine was .716 ounces per ton, making it one of the highest grade gold mines in the Western U.S. The Washington Mine is the current focus of the company’s capital and energy, but that does not take away from the significant opportunities at our other projects. During 2011 100% of the San Juan Ridge Mine was acquired. The San Juan Ridge mine had mineable reserves of 257,000 ounces according to a 1990 feasibility Study by Pincock, Allen and Holt International Mining Consultants. Remaining reserves are estimated at 240,000 ounces of gold. Shasta Gold Corp Management is committed to building long term, low cost gold mines which will ultimately translate into shareholder value. A gold mining company with a long term view must be able to weather the storms of variable gold prices, increasing labor and material costs and increasingly stringent environmental responsibility. For these reasons, high grade underground gold mines will be the future of mining in the politically stable Western U.S. Shasta Gold Corp. will be ahead of our competitors by recognizing where the opportunities are and focusing on sustainable growth in high grade, underground, environmentally friendly projects. Why is high grade so important? Underground mines have a very small footprint as compared to open pit mining. This translates into more socially acceptable projects in a more environmentally sensitive world. In addition, underground mines, especially deep seated mesothermal veins, tend to be long life projects allowing a mining company to amortize of their investment over many years. Shasta Gold Corp believes that the best opportunity for stable growth is to focus on high grade, low cost, long life underground mines that are in areas with good infrastructure and political stability. There has been a substantial consolidation in the gold mining industry over the past 10 years with mining companies gobbling up one another.The idea being that you can buy production and management quicker and cheaper than you can build it. This has resulted in larger companies that need a pipeline of economic multi-million ounce gold deposits to show growth. This, in turn, has resulted in the mining industry flocking to less developed countries where the perception is that it will be quicker and easier to build a new project. But in reality, lack of infrastructure, lack of skilled labor, ever changing environmental, mining and ownership rules, and political instability can quickly increase costs,risks, and delay startup time estimates. Shasta Gold Corp. management firmly believes that there is a terrific opportunity in obtaining projects that are too small to have a significant impact on the larger gold mining companies, but are large enough to provide steady growth rates for Shasta Gold Corp. These new projects would have the potential of 15,000 to 50,000 ounces of gold per year. Typically these deposits will have been explored or developed by larger mining companies that found that the developed gold deposit did not fit their business model. In summary, our mission is to acquire and develop high grade, underground gold mines with the potential of 15,000 to 50,000 ounces of gold per year each, all in politically stable areas, with access to skilled labor and good infrastructure. As testimony to the potential of the geology of these types of targets, Newmont Gold Corporation owned and operated the Empire Mine 150 miles south east of the Washington Mine. The mine operated for over 100 years and produced over 6 million ounces of gold from narrow, high grade veins similar in grade and width as the veins at the Washington mine.